The downloadable full report contains eight articles that deal with the September 11, 2001 World Trade Center (WTC) disaster and its consequences, written by researchers at the Massachusetts Institute of Technology. For the most part, these articles were prepared between September 2001 and February 2002, and were revised in part in the spring of 2002. Indeed, some of these essays were largely written in their present form in the days following the disaster, which saw the first light in September of 2001 as opinion pieces in one of MIT's internet sites, and as internal research reports. At about the time that the rough draft for this book was finished, an important study on the WTC came to light, namely the FEMA-NIST-ASCE report, which contained a wealth of new factual data. While this report could have provided additional material for the preparation of a revised version of this work, it was felt that the essays herein were not superseded by the FEMA report, but continued instead to be relevant and worthy of publication in their own right. Indeed, the FEMA report substantiated most of the writers’ earlier views as to how the towers were wounded, how the fire affected the structures, and how they ultimately collapsed. The book begins with a brief history of the Twin Towers, then continues with several technical analyses of the collision, the fire and the collapse of the towers, and concludes with two forward looking articles, one on possible future emergency escape systems from high rise buildings, and another on the consequences of terrorism on industrial supply chains ¾in brief, the timely and adequate supply of raw materials and parts to factories and business. Fernandez commences by reviewing some historical facts about the design and construction of the towers. Thereafter, Kausel reminisces about the crash of the towers and expounds his early theories as to the reasons for their collapse. He then proceeds with an analysis of the speed of the aircraft immediately prior to collision in an article that led to a cover page story in the New York Times last February, which was carried around the world by the major news media. Wierzbicki follows with a detailed analysis of the collision of the aircraft, and the heavy damage that they caused to the structures. From his exacting mechanical analysis, he concludes that the North Tower must have lost between 4 and 12 core columns ¾out of 44¾ while the South Tower lost between 7 and 20 such columns, and that both were brought to the verge of collapse by the collisions. Ghoniem examines carefully the fire conditions inside the towers, and determines that the temperature within the buildings must have been close to 1000°C, hot enough to significantly lower the stiffness and strength of the steel columns and girders. He also demonstrates that the chemical power of the aircraft fuel together with the combustible materials in the building, when released as heat over the course of one hour, was a staggering one gigawatt, which is comparable to the power of a large electrical power plant. This provides substantiation to the notion that the fires played a critical role in the collapse of the towers. Buyukozturk and Ulm proceed with a materials and structures analysis of the towers, their interaction with the fires, the effects of these on the structural materials, and the mechanics of collapse. They also discuss how the vulnerability of future high rise buildings could be ameliorated by the widespread application of the concept of “redundancies”. Fernandez elaborates on a series of new escape systems for high rise buildings under fire (or damaged by explosions) whose aim is to bypass impassable floors or blocked stairways. These would allow people trapped in higher elevations to escape safely to the street. He considers various types of devices, including those that can be deployed inside or on the exterior walls of the building. Finally, Sheffi discusses the effects that terrorist acts can have on the timely supply of raw materials and parts to industry, and on the need for a new strategy that blends on-time supplies with adequate strategic reserves, or as he succinctly puts it, “just in time and just in case”. The Reflecting Wall at MIT, a 12-by-25-foot wooden replica of a fragment of the wall of the World Trade Center installed next to the MIT Chapel, was proposed and designed by Assistant Professor of Architecture John Fernandez in the days immediately following the disaster in New York. He conceived it as a temporary space where people could pause to reflect on the nearly 3,000 people who died in New York, Virginia and Pennsylvania after terrorists piloted hijacked airplanes. 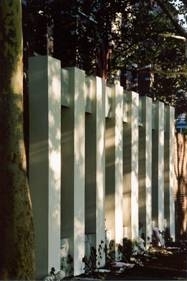 Fernandez proposed an actual-size wall fragment, abstracted to wood rather than aluminum, of “the icon of New York” in memory of all victims of the Sept. 11 terrorist actions. At the dedication ceremony, he said one of the images that stayed in his mind was that of the people inside who pressed against the skyscraper's windows, trying to escape the flames. “This is the first project I've ever worked on that I wish that it had never been built,” Fernandez said. “But after Tuesday, it had to be built.” One feature that wasn't in the original wall are the slots below the window ledges, which were requested by students for letters, notes and memorabilia. The Wall was dedicated Friday September 14, 2002 in the afternoon when 400 students, faculty and staff laid roses, candles and notes on the structure. The dedication ceremony at the Reflecting Wall by the walkway to the chapel began at 5:15 p.m. on Sept. 14, just over 48 hours after the request was first voiced.